Written by Rev. Peter G. Shadid. The Arab League met repeatedly, and disagreed; the United Nations met and talked a lot and couldn’t agree. Each one offers a solution in their own way making things more difficult and making a cold war. The storm arises the wind comes from everywhere and the waves get higher, the war goes on, and now the ship goes away from the shore of peace, without hope and without help leaving only one way up and that is to resort to the Lord of the universe. I wish all fighters with conscious would wake up and use their mind now and act wisely before it is too late! Jesus gave the greatest sermon in history, (Sermon on the Mount) on Mount Hermon, in Syria according to the Gospel of( Matthew ch-5-7 ) Syria, you are the cradle of the prophets and apostles and the center that spreads the gospel from Antioch in Syria to the world, and paved the way of the Forefathers of the Church to continue. Syria, do you remember you are called “the cradle of civilizations and Semitic peoples, and their languages?” God spoke on Mount Horeb, Hermon, and Golgotha, and most of the prophecies on your land were fulfilled. Do you remember well, with the entire world, of the biblical history and privileges of what God has done through all of Syria and also to the whole world! It seems that the world ignored or disregarded to study such great history of Syria!! Here today as they sit and only to watch TV, they are amazed of what they see happening in Syria right now. That is the objective of the author in this article to provide a manual of study and a call for prayer to Syria. First - the physical condition: Let me just take a quick glance of what I've seen in the year 2010, about two years before the civil war, and I will start with the visitor’s impression and then the tourist. First, what the eye sees such as the construction on the road, and in particular the new town of Ghasom in Horan (my home town). What really surprised me more was that not one of the old houses was suitable to live in. Today the old town is like a museum ruins. New modern towns have been developed around the old towns. Moreover the strangest thing was when I was touring the city of Der’a, I saw the city as if I was in one of the most developed cities. Some said that more than 500% new modern buildings have been added. I soon notice that the old town did not exist and there was no trace of it. Now I’ve just arrived on my journey to the borders of Jordan. Der’a is 5 miles from the border of Jordan, but now it is all one. Der’a has expanded so much, East, West and North. I noticed a lot of garages for cars, and fine hotels, car rentals and running yellow taxis in all the streets. There is no doubt that the enumeration of the population explosion in a period of twenty years, therefore, think how much more the population has increased with the new buildings! Der’a is just like if you were to visit any modern city in the World!! Damascus being a historical city is pided into two parts, the old and modern, Damascus is a modern capital like other modern cities.The only difference is that it has a vivid Arabic character and splendor of its own Damascus has grown so much in the surrounding suburbs and neighboring areas and it has become (Greater Damascus). Damascus, was called Fayha, (oasis of the Arab world) it was and still is a beacon and inspiration to all poets of the East and West. It has a glorious history, considered a world archaeological museum and the world’s oldest living city in the world. It is equipped with the most modern technology to respond to any problem in the city. Syria, relatively, has now a very high standard of education it is FREE FOR ALL LEVELS!!!! For this it attracts a high number of Arab students to colleges and higher education. Syria also has always supported the goal to eliminate illiteracy of all segments of society, and they did. The goal is that a high percentage of people today have a baccalaureate (High School) for males and females. The proportion of female staff in government departments has reached 40%, while the number of students in high schools and universities around a few million which is relatively very good. There are five public universities and a good number of private universities in Syria which offer a variety of specialties. Syria is considered one of the rich countries in its Petroleum and Industries. Syria has highly developed as it seems in 2010!! For almost forty five years, the rain was scarce and the soil in the land was dry. As an example, the Horan area is considered the richest in the Middle East in agriculture because of its soft fertile soil, which was called “The Basket bread of Rome”. Therefore, the land has remained barren due to “the lack of rain”. But now, it is almost unbelievable for the eye to see the fresh vegetables and fruits that dress the land after years of drought and scarcity. I took a car and went through some villages in Horan and there you will find in all the villages and houses, tall trees and olive grove in particular, which made many of the displaced to return to farmland for attention by digging wells for water. On traffic highway we saw fresh fruits and vegetable markets and stores, restaurants and gas stations. This has been undoubtedly the greatest factor that improved the standard of living progress and prosperity to the economy in general. Here our visit ended. -It has become a great Christian center. -It was the center of higher education (theological schools) which was spread all over? 3 –Those who lived during and after the council of Nicea. The ones who attended the council of Nicea were mostly from Greater Syria, the Gulf, Arabian Peninsula, Egypt, Asia Minor, Europe and other parts of the world. Also Constantine, the emperor, had attended, whom God used. His mother Helena deserves the credit by leading him to the faith in Christ. The “Church of the Resurrection” was built in Jerusalem and called by her name. Constantine, the Emperor was the one who officially introduced Christianity to be the official religion of the Roman Empire. - Aramaic, Arabic in northern Syria, and the Euphrates. The classical Arabic is most related to Syria. - Aramaic Nabateans, in Jordan and Yemen. The Ghassasinites came to Syria from Yemen, established their kingdom and they, in turn, improved much of the Arabic Nabateans and continued to be classical as we see it today. We must not forget that the Hebrew and Arabic came from the same root of the Aramaic. They have similarities in grammar and vocabulary. 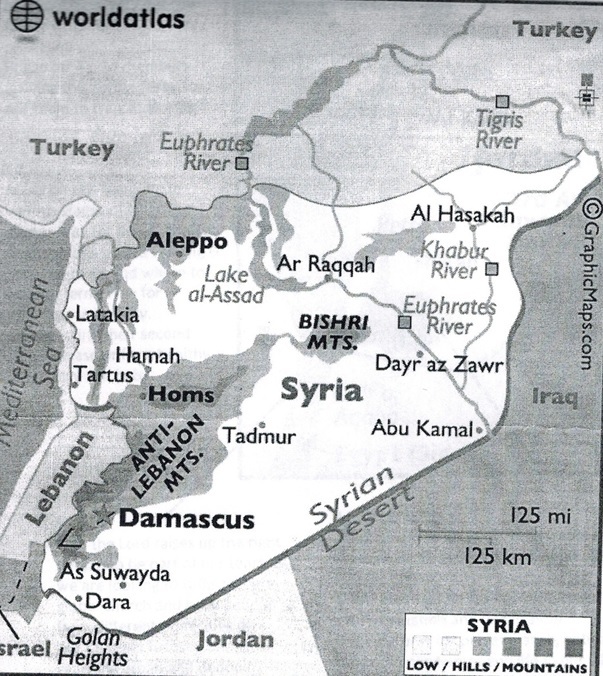 This proves that Greater Syria was actually “The cradle of family Semitic languages of all the Middle East. Now come with me to Lattakia, one of the oldest and greatest places to explore the ancient ruins which take us back to the thousands of generations. Ugarit is the birthplace of the first alphabet in the world located about 15 miles from Lattakia. It was in Ugarit where the alphabetic script was first used successfully by the Phoenicians marking a great leap in the progress of human civilization. It is the name of an ancient city on the North Syrian coast opposite the island of Cyprus, 40 miles SW of Antioch; also called Ras Shamra. The city, with its port, Mina el Beida (White Harbor), was an important commercial center through which passed the trade of Syria and Mesopotamia with Egypt, Cyprus, and the Aegean area. Occasionally antiquities had been found here by local people, but in 1928 a peasant struck the roof of a buried tomb with his plow and made a discovery which attracted the attention of the authorities to come... The French authorities were in charge of Syria at the time. In 1929 archeologists from France’s famous Claude F. A. Schaefer began a series of excavations which have revealed much of the history of the site. The excavations continued until 1939 resulting in the discovery of many objects of great archeological value, including hundreds of Tablets known as “The Ras Shamra Tablets”. The French have continued digging at Ras Shamra until today, although with more involvement from the Syrians in recent years.. The excavations have revealed an extensive Late Bronze Age city (14th-13th centuries B.C) with a trace of temples and houses , most of which have revealed troves of texts. One of these famous discoveries, which provided hundreds of manuscripts on stones and some pictures and statues that after study and translation, gives us a wealth of rich information. Then back again to Lattakia, where discoveries were discovered here with the utmost importance namely” Kingdom Marie” which dates back to the era of Abraham who passed through Damascus, and called his agent ( Eleizer of Damascus) ( Genesis 15:2). In Damascus, we find hundreds of ruins that tell about the events of the New Testament the Apostles such as the story of Paul. In conclusion, this is just a brief glimpse and handful of information about the Significance of Syria in the Bible and world history. It is again to give a manual to educate the readers to study further and to be more knowledgeable and thankful to God for what He has done in and through Syria to the World!! Moreover, remember to pray for God to save Syria from this agony of civil war!! Syria! Cry out to God similarly and you will be saved! 3. Remember and hear the voice of God, on Mount Hermon from the midst of the glorious cloud saying; ”This is my beloved son whom I am pleased, listen to Him” And there were two prophets Moses and Elijah and Because of the strong light of Transfiguration, the disciples fell on their faces bowing down to worship. 4. Remember, Oh! People of Syria, remember how Paul, the apostle, was converted from a terrorist to a greater apostle of God on the road to Damascus and how the Gospel was spread to the whole world first from Antioch in your land! 5. Remember and hear the voice of God from Mount Horeb to Mount Hermon toMount Golgotha. The Lord Jesus said” I am the light of the world and he who follows me will not walk in darkness but will have the light of life”. You are in a furious storm, not a storm in a teacup but in a storm from Satan!! Cry out to God to save you physically and in spirit. Come back! Come back! And believe Him! You will be saved as people and as government “There is no other way to salvation.” Jesus said: (“if you keep silent the stones will cry out”). Your land is screaming and your mountains are crying. God is calling out; (Come untome and you will be saved). Millions of believers are praying for you Syria, for real peace and salvation. Believe that Jesus will visit you again Syria and make miracles, he still loves you, so do we! 2. If you need a few more copies, please send us your address or email address. 3. If you would like a book written on this subject please respond.